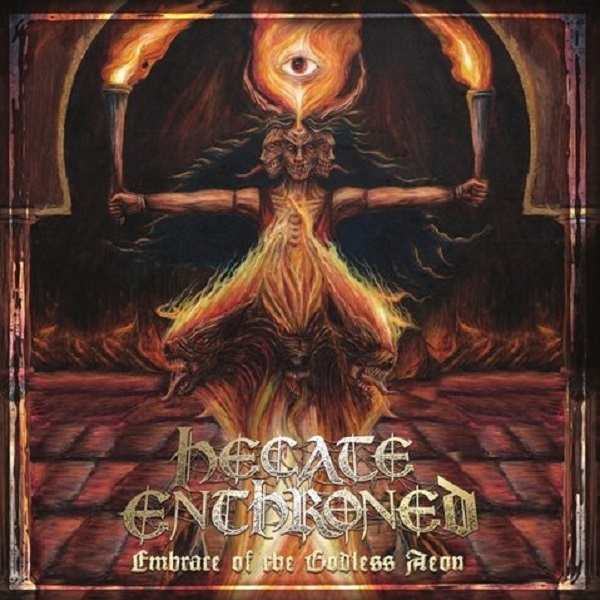 A blast from the past made it to our review queue today with Hecate Enthroned and their first album in six years “Embrace of the Godless Aeon”. We remember back in the late 90’s when bands were trying to sound like Cradle of Filth and while many tried, Hecate Enthroned was one of the few that got close. While the band got unfairly treated as a clone, we always enjoyed their spin on Symphonic/Gothic Black Metal back in those days. With a new vocalist and their signature style, the band makes a very strong comeback in 2019. Blasting away after their atmospheric intro, “Revelations in Autumn Flame” takes us back in time with the over the top synths that nicely contrast the shrieks and blast beats. The mixture of growls and shrieks is definitely something that attracted us to the band back in the day and on tracks like “Temples that Breathe” brings back some nice memories. However, the best thing about the band is how they create sinister atmospheres thanks to the sultry voice of Sarah Jezebel Deva in “Goddess of Dark Misfits”, our favorite song in the release. The album continues to get more exciting and interesting as tracks like “Whispers of the Mountain Ossuary” and “Enthrallment” delivers epic melodic passages and very melancholic moods. Others looking for intensity and devastation, “The Shuddering Giant” keeps the brutality high while surrounded by cool atmospheric elements and catchy tempo changes. Closing with the mysterious “Erebus and Terror”, we are left hypnotized by Sara’s vocals and the overall progression of this track. In general, Hecate Enthroned is releasing an album that will certainly turn heads due to its quality and diversity. With “Embrace of the Godless Aeon” the band returns to the spotlight with quality music and their signature style, be ready to be blown away by it.